A fine result last night against high flying Ayr United. However, the week's work is only half done. 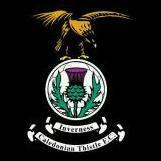 That victory will count for much less if we can't repeat it on Saturday against low lying Patrick Thistle. There is no room for complacency, Patrick are battling to avoid successive relegations but, with the right attitude and loud vocal backing we can retain our promotion chasing momentum. Agreed all on all fronts. We should be going into Saturdays game full of confidence and with nothing to fear, start brightly and try to blow them away within the first 20-25mins and I doubt they'll have enough to punch back. 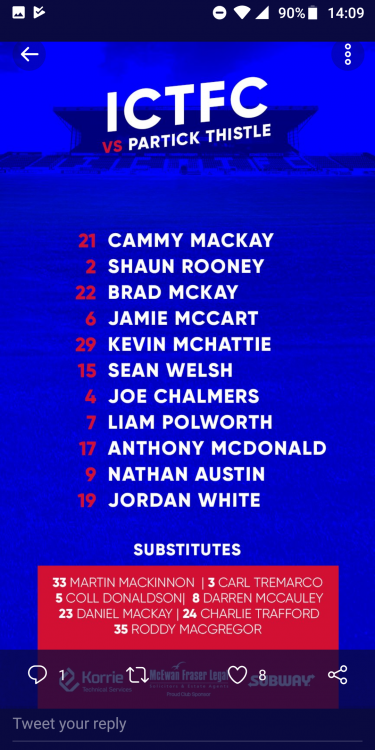 Having listened to a Gary Caldwell interview with Caleyjag on the radio a couple of weeks ago following one of their games, I'd love to see us do them, his attitude was appalling and treated the interviewer with complete contempt. Another manager to add to the list of dislikes that I currently have. Beating the Jags is an olde Caley habit. As has been alluded to in a number of posts we are better away from the Dump and it is about time that we started putting away teams at home, easing the nervy home support and three points in this type of game are practically essential. I appreciate that young Cammy played his part at Ayr but I really do hope that Ridgers is back. We again have done well but Donaldson and Ridgers are the main men. It will undoubtedly be the same back four. I hope he also persists with the same middle four as they were effective and two holders and two passers is a good combination. Again I suspect that Robbo will go again with Oakley and Austin. Austin may well have saved his place with the Ayr brace. Pity as I liked the look of McCauley. Just found out that they have moved the away fixture with Partick in March to Friday night! Which rather spoils my plans to fly up Saturday morning with my wife, eldest daughter and her boyfriend to match the match. Annoying much! Love to see the video of the match? Yes I heard that interview too : he was clearly not happy at his club's situation! Can't see him lasting long. Agreed we need to win on Saturday to keep a bit of momentum going Our home record is poor (2 wins in 11 games) and we have taken more points on the road (20 against 13). We currently sit top of the away league, but third botom of home league. We sit second in form of last ten games overall, so if we can continue to improve our home form we will not be too far away at all. Personally, I would settle for Patrick Thistle at least one fewer than Caley Thistle. Probably the one with Heather Dewar of the BBC after the Falkirk game. Between the pair of them it was a car crash. he sounds like a guy who has got some good views of how football clubs should be run, oh and his insight on players is top notch. CTO Preview now online........... You're all in it! Caldwell could have said we have definitely come through the window a stronger side but he has sowed doubts by saying he thinks they are stronger. Clearly a slight confidence issue as a manager. We will see. Brad should never start again after today !! I would brother but iv a terrible stutter!